Integrative Wealth Organizer : Sauser Financial, LLC - Integrated Strategies. Comprehensive Solutions. Your single access point to consolidate and track your personal, business and financial data in one secure location. The fact is the more wealth you have, the more time and knowledge it takes to protect and grow it. Since most advisors, such as: your accountant, attorney, banker, insurance agent, investment broker and trust officer, offer services independent of each other, it is up to you to sort through all of their ideas and recommendations. So you turn to a CERTIFIED FINANCIAL PLANNER™ practitioner for advice on the issues that revolve around you and the financial issues they help you manage. As your wealth grows, life doesn’t get simpler; it gets more complex. What if you could organize all of your advisors and assets, and consolidate them in the same place at the same time; a place where you could review all your financial and business accounts, copies of tax and legal documents, and specific goals and strategic plans, organized and updated daily, accessible whenever you want it? 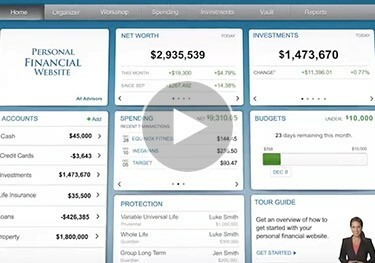 Our industry leading Integrative Wealth Organizer was built to consolidate your accounts, your assets, and your advisors into one secure location, your personal financial website.